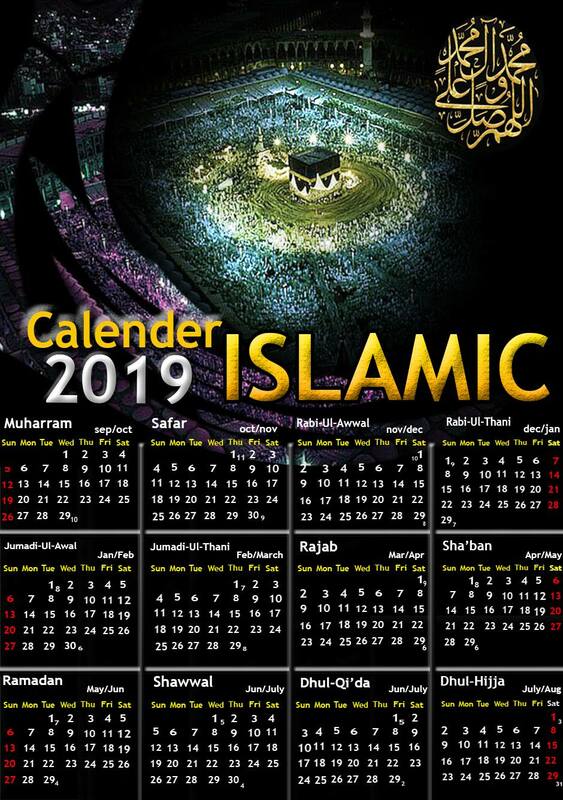 Islamic Calendar 2019 is here to guide all Muslims throughout the year for Islamic events and rituals. It is also called Hijri Calendar and consist of twelve months. The names of Islamic months are Muharram, Safar, Rabi-ul-Awwal, Rabi-ul-Aakhir, Jamadi-ul-Awwal, Jamadi-ul-Aakhir, Rajab, Shaban, Ramadan, Shawal, Zulqaida, and Zillhijjah. The start of Islamic months depends upon the spotting of the new crescent moon. The month of Muharram, Rabi-ul-Awwal, Ramadan, and Rajab, Zillhijja are most important due to some special events of these months. Ramadan is the month of Fasting, Rabi-ul-Awwal is important due to the birthday of Prophet (PBUH), while Hajj in the month of Zillhijja. 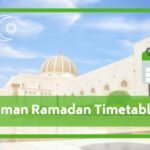 This Islamic Calendar 2019 (Hijri Calendar) will provide the most reliable timetable for religious celebrations. 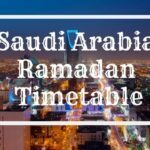 You can find the dates of all important Islamic events like Eid-ul-Adha, Eid-ul-Fitr, and the start of Muharram and 10th of Muharram-ul-Haram, Ramadan Kareem and many more. You will find two dates in each box. The dates in red color represent Islamic calendar dates. We are in 1440 AH the current Islamic year and 5th of Shaban in Pakistan. You can easily find out the current Islamic calendar date and year in your state or country by using simple apps. Also, the Islamic calendar 2019 mentioned can guide you more briefly with the exact date. Islamic calendar’s length depends on the lunar cycle; each month in the Islamic calendar depends upon the moon’s visibility. Every month in the Islamic calendar consist of 29 to 30 days. 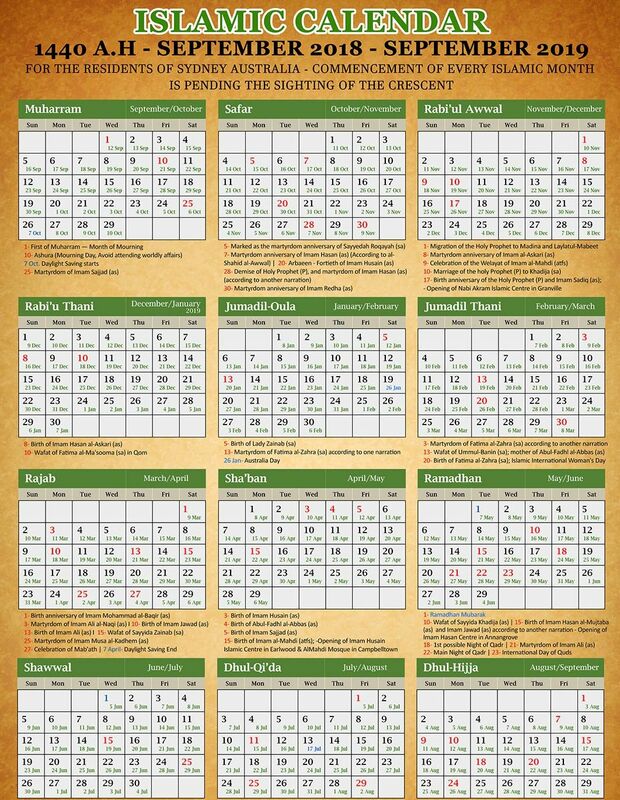 Commonly Islamic week or days starts at sunset, same like Baha’i and Hebrew calendar. In Islamic weekdays, Friday is the most prestigious day when all Muslims gather along and offer Jumma prayer. Mainly in countries like Saudi Arabia and Egypt Friday and Saturday, both considered as weekend irrespective to other Muslim countries. People think the tabular Islamic calendar is different from the Islamic calendar this is not true, these both are similar. Tabular Islamic calendar also does not base on astronomical calculation although it’s based on rule variation Islamic calendar. Tabular Islamic calendar includes 19 years of 354 days and 11 leap years of 355 days. As the Islamic calendar is purely a lunar calendar, which is why months in the Islamic calendar depends on the motion of the moon. Each month of the calendar starts based on first seen of lunar crescent right after a new moon. That is for Islamic calendars are printed on estimate basis and mostly on predictions. 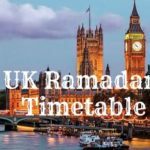 Islamic scholars use different methods for estimating Islamic Hijri calendars. The Islamic calendar is also known as Hijri and Muslim calendar. Islamic calendar based on lunar observation and it is shorter than the solar based calendar. Among Muslims Islamic calendar used to be most significant in determining the holy/Islamic rituals and holidays. Such big Islamic rituals involved a right time of Ramadan fasting as well as time for a pilgrimage to Mecca. 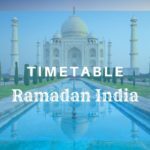 In particular, the Islamic calendar is crucial and significant for all Muslims to perform rituals according to their religion Islam. However, most countries with the predominant religion Islam based on the Gregorian calendar as their civil calendar just. On the other hand, Afghanistan and Iran use Solar Hijri Calendar as their civil calendar. 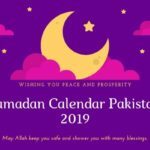 On the basis of Islamic rituals and holy events, most prestigious holy months in Hijri calendar are Muharram (1st month), Rabi-Ul-Awwal (3rd month), Ramadan (9th month) and Zul-Hajj (12th month). Muharram is the most prestigious month in entire Islamic history, in this month the divine example of sacrifices from the entire family of the grandsons of the Last Prophet taken place. This is the month when Muslims reminds the ever greatest examples of sacrifices for the sake of Islam refreshes and deepen faith in Muslims. The holiest month of Ramadan brings loads of blessings, grace and mercy which then followed by Eid on Shawwal 1st. The third month of Islamic calendar Rabi-Ul-Awwal is the birth month of Last Prophet Muhammad (Peace be upon him) therefore it carries its own precious significance. Muslims from all over the world followed the Islamic calendar to be updated on holiest events and rituals annually. The most beloved Last Prophet Muhammad (peace be upon him) and second caliph of Islam Umar ibn Al-Khattab were initially introduced Islamic calendar or Hijri calendar. Contradiction to the year of introducing Islamic calendar, some believed it was the year 638 AD and some agreed on year 622 AD/CE. Islamic calendar was initially known as Hijri Era, this was the same year when last Prophet Muhammad (peace be upon him) and His followers migrated to Medina (lately known as Yathrib) and gathered as the first ever Muslim Ummah (community). The Islamic Calendar which is also called Hijri Calendar is released today.